It's the deadliest combination going... Bullies who get what they want from their target, bullied kids who are afraid to tell, bystanders who either watch, participate, or look away, and adults who see the incidents as simply 'teasing' and a normal part of childhood. We have only to look at the headlines to understand that this is a recipe for tragedy. Some bullying victims, their cries unheard, have fought back with violence that has devastated entire communities; others have committed suicide; many more suffer in silence, their lives a constant round of emotional and physical pain. 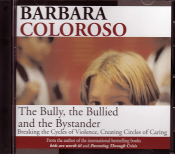 In this 80 minute presentation before a live audience, Barbara Coloroso gives parents, caregivers, educators - and most of all, kids - the tools to help break the cycle of violence and create circles of caring. Topics include: Bullying - What it is and what it isn't The Bully - the differences and similarities between boy and girl bullies; what to do if your child is a bully. The Bullied - warning signs and steps you can take if your child is being bullied The Bystander - how they aid and abet the bully and how they can become peacemakers.